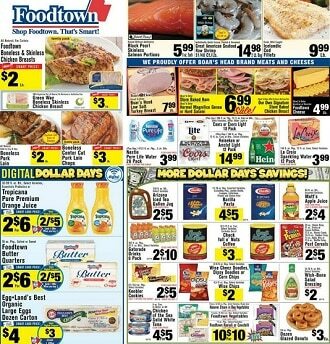 Here is the Foodtown Weekly Ad, valid April 12 – April 18, 2019. Don’t miss the Foodtown Ad specials for this week, catering offers and Buy 1 get 1 Free Deals. Super savings for Maxwell House Coffee, Domino Sugar, Southern Yams, Simply Premium Orange Juice, Purex Liquid Laundry Detergent, B&G Salad Olives, Vigo Yellow Rice, Reese Ham Glaze, Maple Grove Farm Pancake Mix, Old Spice or Secret Deodorant, Pantene Shampoo, Cook’s Spiral Sliced Ham, Italian Style Sausage, Purina Beneful Dry Dog Food, Stella Blue or Gorgonzola Cheese. Don’t miss this week Foodtown ad deals and don’t forget to print off your coupons before heading out to shop.